The Dallas City Council was briefed Wednesday on the city's options for one of its most prominent Confederate monuments. There are three paths for the Confederate War Memorial that stands in Pioneer Park Cemetery near the Dallas Convention Center: keep it, remove it or do nothing. A majority of councilmembers voiced their support for the removal during the public briefing. "There's no question in my mind where I am with this," said District 7 councilman Kevin Felder. "We must take down the statues. We must take them down. We don't need to re-envision anything." If they vote to keep it, the monument would be "re-envisioned" by multimedia artist Lauren Woods. The visiting lecturer at SMU was selected by the Office of Cultural Affairs for her work re-contextualizing Jim Crow-era imagery. In 2013, Woods unveiled A Drinking Fountain Project, which turned a "Whites Only" sign uncovered at the Dallas County Records Building into a memorial to the civil rights movement of the '60s. "How do you think Black people and the people of color who watched these monuments being erected in Dallas — knowing what purpose they served — felt?" Woods said during the briefing. "Their struggle, their resilience, their triumph, their story needs to live in the public memory." Removing the monument would entail disassembling it into smaller pieces and storing it. That's estimated to cost around $480,000, according to assistant city manager Joey Zapata. District 5 councilmember Rickey Callahan voiced his opposition to the monument's removal, saying the cost was prohibitive. "We can't even do the things we're supposed to do, but yet, this is a priority," he said. "To take statues down that can't even speak? To me, it's a misplaced priority." Doing nothing would prolong a debate that began in 2017, when Dallas city officials began considering the removal of public Confederate monuments in the city after the deadly protest in Charlottesville, Virginia. The statue of Confederate general Robert E Lee in Oak Lawn Park came down soon after that, but the city council voted to delay action regarding the monument in Pioneer Park Cemetery. The granite base that supported the now-removed statue of Robert E. Lee in a Dallas park and the seating and stairs surrounding it will be disassembled and stored. The Texas Department of Motor Vehicles has denied a Confederate group's latest attempt to create a specialty license plate celebrating Confederate soldiers, a design that does not include the Confederate battle flag. Though Houston and Harris County make up one of the most ethnically and racially diverse metro areas in the country, that hasn't always been reflected in its judges. 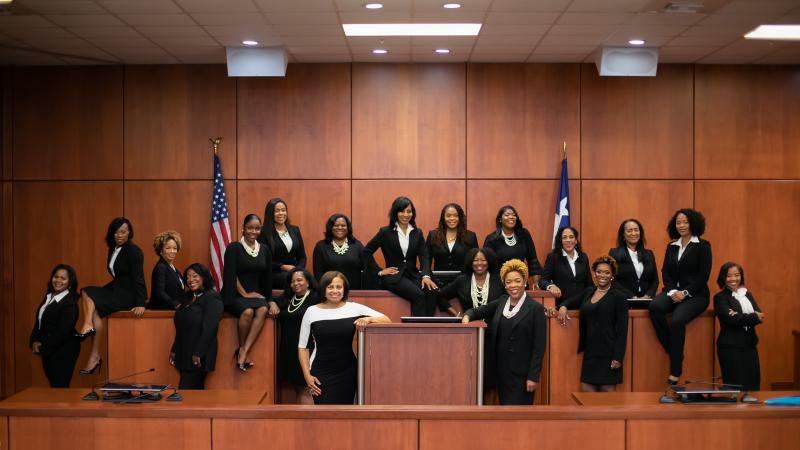 But the region recently took a big step towards representation when it elected an additional 17 African-American women to the bench, bringing the total number of African-American women judges in the county to a record 19.